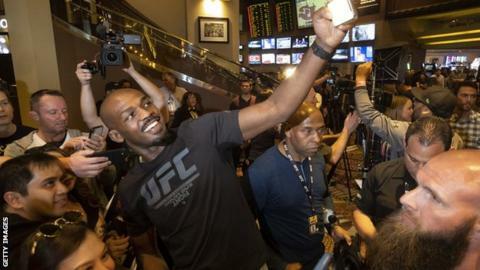 Jon Jones says he "has no shame" about traces of a banned substance being found in his system before his light-heavyweight title defence at UFC 235. The American faces Anthony Smith at Las Vegas' T-Mobile Arena on Saturday. Jones will be allowed to fight, with authorities believing the substance remains from a positive test for which he has already served a suspension. "I am comfortable with the idea that it's going to be a part of my career," said Jones. The 31-year-old was handed a 15-month backdated ban after testing positive for a banned substance before UFC 214 in July 2017, although the United States Anti-Doping Agency (Usada) found he "was not intentionally cheating". In December, UFC moved a whole card from Las Vegas to Los Angeles at five days' notice after he tested positive for a tiny amount of the same metabolite and the Nevada State Athletic Commission (NSAC) said it did not have time to investigate. The NSAC then confirmed on Thursday that two of five drug tests it subjected Jones to in the run-up to UFC 235 also returned positive tests. However, it said Jones was "co-operative" and that there was no evidence the metabolite had been re-administered or would give him an "unfair advantage". "I just wish fans would not just look at the headlines, click on the links and read and learn what's going on," added Jones. "I am comfortable in this space. I've set myself free from any level of embarrassment, I have no shame. "What makes me sleep at night is knowing I have submitted myself to every drug test, I am getting tested by three of the most powerful agencies in the world, I have never avoided a test." Jones, who has been tested by the NSAC, Usada and the Voluntary Anti-Doping Agency, says he has learned of Major League Baseball players and other fighters in the UFC who have suffered the same problem. "When I found out the last event was cancelled and switched, I broke down crying," added Jones, who beat Sweden's Alexander Gustafsson to claim the vacant title. "I just feel like the more I am accessible, the more data they'll understand and the more everybody will understand. "Every time it's like an 'oh darn it' moment, but I am comfortable with the idea that it's going to be a part of my career and I don't know how long this is going to last. "I am not going to allow anything to hurt me any more. I am not going to let it bend me or break me."